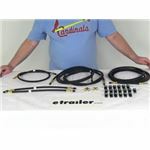 Brake line kit lets you run brake fluid from your surge brake actuator to your trailer brakes. Great for disc brakes and torsion axles. Includes 15', (2) 7', 3-1/2', and (2) 1-1/2' flexible hoses, plus fittings and hardware. Call 800-298-8924 to order Kodiak accessories and parts part number 15TA-BLKIT or order online at etrailer.com. Free expert support on all Kodiak products. 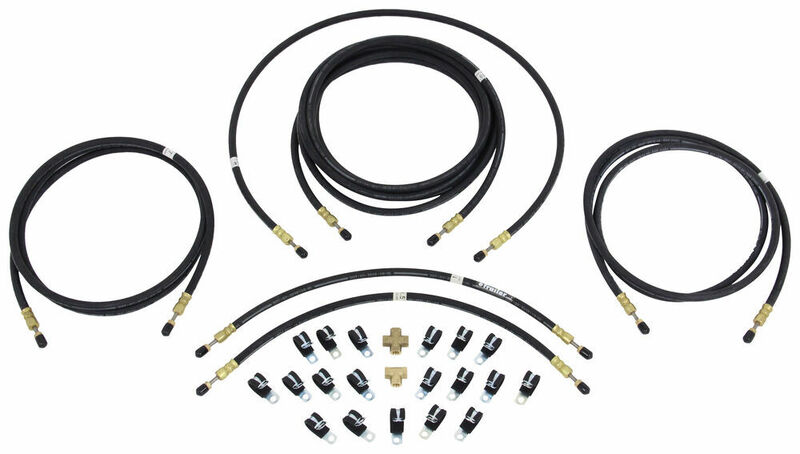 Guaranteed Lowest Price and Fastest Shipping for Kodiak Hydraulic Brake Line Kit - Tandem Axle - 15'. Accessories and Parts reviews from real customers. Brake line kit lets you run brake fluid from your surge brake actuator to your trailer brakes. Great for disc brakes and torsion axles. Includes 15', (2) 7', 3-1/2', and (2) 1-1/2' flexible hoses, plus fittings and hardware. Kodiak brake hoses are made of rubber, making them a practical choice for a variety of applications. 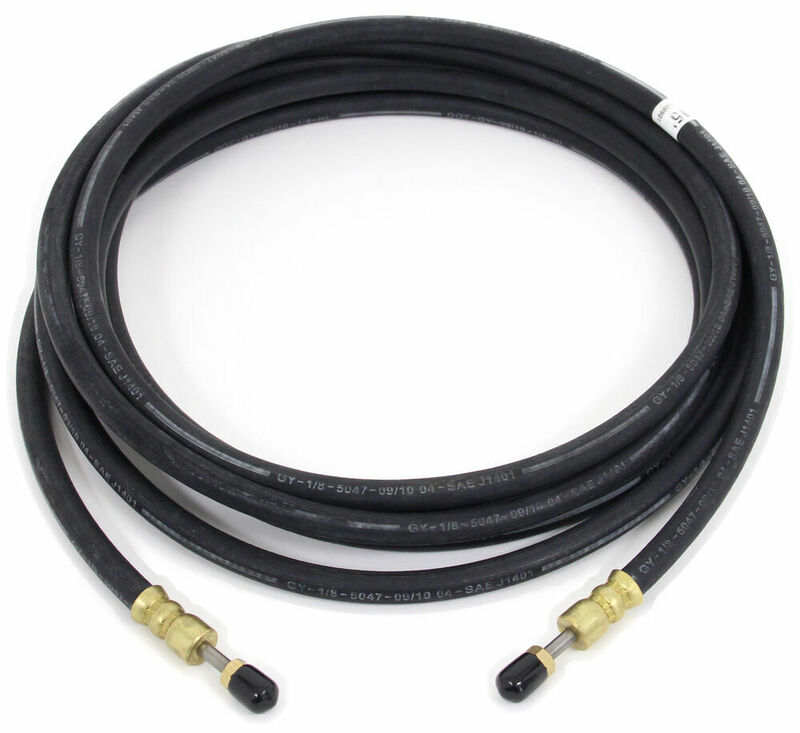 Because you can easily bend them, rubber hoses are simpler to work with than rigid stainless steel brake lines. This flexibility makes rubber hoses great for use with foldaway trailer tongues because they are less likely to kink or break when bent. In addition, rubber hoses allow for a wide range of motion so articulating parts can effectively function. These qualities make rubber hoses better suited than steel lines for trailers with torsion axle suspension systems and trailers that have disc brakes. Stainless steel brake lines have braided exteriors, which can not only wear against exterior surfaces, but also against the interior lining of the hose if dirt gets underneath the steel braid. And if the braid on a stainless steel line tears, it can cut into the hose lining. The exterior surface of these hoses is solid rubber, so there are no crevices for debris to enter. Kodiak brake hoses have corrosion-resistant brass fittings with stainless steel flares. These fittings have a gap built into them that allows room for a line wrench - also called a flare nut wrench - to slide over the line and down to the nut. This type of wrench grips the nut better than a standard open-ended wrench so there is less chance of stripping the threads as you tighten down the nut. The stainless steel that is used to create the flares on these hoses is stronger than brass. As a result, these fittings are more durable than ones made entirely of brass. The stainless flares are primarily designed to keep the fittings from splitting when you tighten them down, but they offer absolute rust protection as well. Kodiak's fittings have deeper threads than many other fittings on the market to provide a higher thread engagement. Deeper threads offer an advantage when used with fittings that have the same thread depth. These Kodiak fittings will work with most fittings on the market, but when they're used with other Kodiak fittings, the result is a stronger connection with fewer leaks. 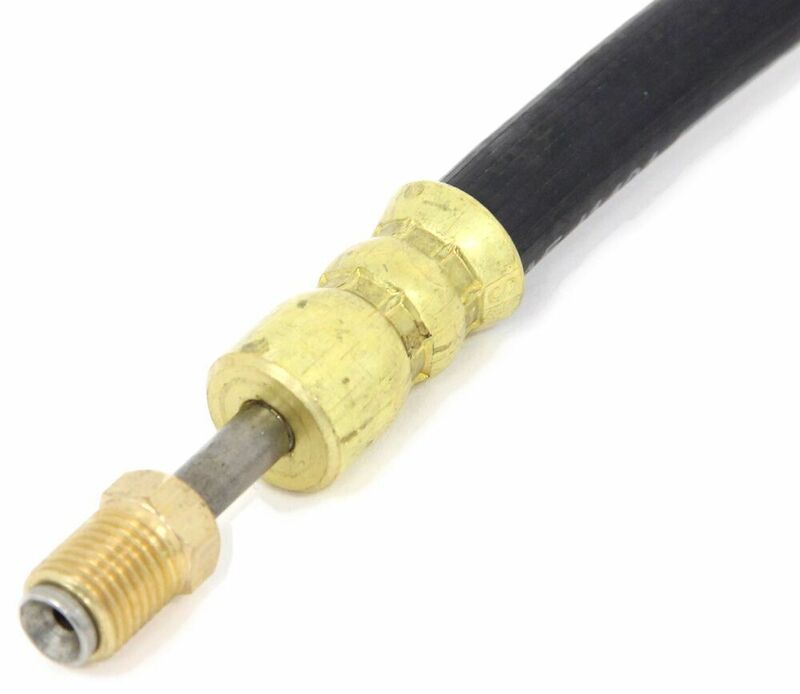 BH-3MFS-15 Kodiak 1/8" ID Rubber Brake Hose - 3/16" MFFN with Male Swivels - 180"
BH-3MFS-7 Kodiak 1/8" ID Rubber Brake Hose - 3/16" MFFN with Male Swivels - 84"
BH-3MFS-3-5 Kodiak 1/8" ID Rubber Brake Hose - 3/16" MFFN with Male Swivels - 42"
BH-3MFS-1-5 Kodiak 1/8" ID Rubber Brake Hose - 3/16" MFFN with Dead Swivels - 18"
A0500 Metal Loom Clamp - 1/2"
Speaker 1: Today we're gonna take a look at the Kodiak tandem axle hydraulic brake line kit. These brake hoses and fittings will let you run the brake fluid from your surge brake actuator to your trailer brakes. These are designed for use on tandem axle trailers with drum or disk brakes, and these are a flexible design, so it makes the hoses perfect for use with foldaway trailer tongues, disk brakes, and torsion axles. 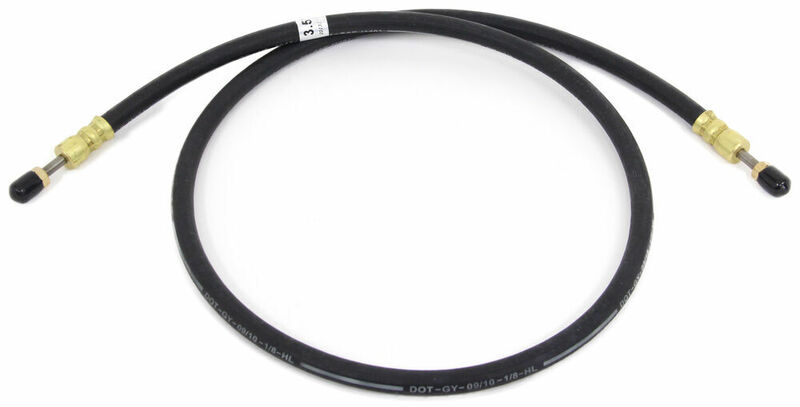 The rubber hoses meet the DOT and SAE standards and they're easier to install than the rigid brake steel lines. These have on the very end a nice brass male swivel flare nut fitting on the end of each hose. They have nice deep threads, and the deep threads will help improve your connection to help prevent any leaks. They do swivel, which will allow the flare fittings to turn without the hose twisting, and if you'll notice, right behind, when you slide this up to install it, there was an open area right here on this flare fittings. That's to let you use a line wrench for a better grip. This'll help minimize the risk of stripping out the threads and the fittings are double crimped right here. You can see onto the hoses themselves.They use corrosion resistant brass fittings that's connected to hydraulic lines right here. They have the female inverted flares on each port on these fittings. Also you'll notice it includes some of the heavy duty loom clamps to secure the hoses to your trailer's frame. This kit will include everything laid out here on the table. Comes with one 15-foot-long flexible brake line, two of the seven-foot-long flexible brake lines, one 3 1/2-foot-long flexible brake line, two of the 1 1/2-foot long flexible brake lines, one cross fitting, one T-fitting, and 19 of the half-inch loom clamps. Now the hose's inner diameter is 1/8 of an inch. The fitting sizes on these fittings right here are 3/16 of an inch, and the thread size is 3/8 of an inch by 24 threads per inch.But that should do it for the review on the Kodiak tandem axle hydraulic brake line kit..
Order: RelevanceNewestRating - High to LowRating - Low to High Brake line kit lets you run brake fluid from your surge brake actuator to your trailer brakes. Great for disc brakes and torsion axles. Includes 15', (2) 7', 3-1/2', and (2) 1-1/2' flexible hoses, plus fittings and hardware.